The 2 tile sizes that will be used in the game. The 16x8 tile cell for text characters. It will be stored in a format of 2 bytes per line. this will make copying faster. eq. (1122334455667788). copied from a set up section in vdc memory. The 48x24 tile cell will be used for monsters and players in combat mode, 6 bytes per line. The color cells are 8x2 and will be stored in a 6x12 format, 6 bytes per color cell line. Thinking of implementing a simple mono color software sprite for the pointer and box thing. It will have a bit mask on the cell level. If 1 then show the solid color, if 0 then leave the cell alone. Working on the code for that then building the combat engine using that. Sounds cool! Good luck and ask for help if you need it. My Media Player 128 used stupid characters for mouse/sprite. This is because I was too lazy to split 1 character into 4 characters (worse case) and do all the messy bit-masking. I did do character-splitting in my failed 4K game "moob" (download here, read about it here)... it failed because couldn't squeeze to 4K, but the character splitting worked fine. Ask for details if you like, main difference is it used 8x8 cells unlike 8x2 cells that you plan! Last Edit: Mar 11, 2015 5:06:27 GMT by hydrophilic: Added links! Sorry for double-post, but wanted to be sure you did not miss this. 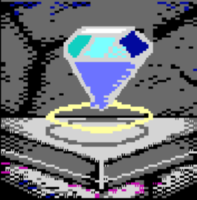 A "remastered" version of Ultima IV has been released... but for the C64... hopefully this will motivate/inspire you! 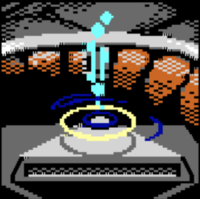 Would really love any new C128 release, but "your" game sounds pretty cool! Notice my last line appears with text imoticon but in the 'preview post' it showed an actually smily icon... yet another bug! Can you say "double fail?" Good, I knew you could! Notice in my EDIT that my typed-out : D actually turned into an imoticon... but the original did not. Can you say "triple fail?" Upon review of the above, it doesn't make much sense... I've seen this happen often with complex systems that fail. The "explanation" needs to be 10x more detailed than the problem, in my experience, with such complex systems. Sorry that my explanation above was only 2x more detailed. So I guess I am making things worse instead of better? Thus I will shut up! I present the Statue of the North graphic. What you think? Mixing up coding with graphic work. Wishing there was a more advanced bitmap editor for 80 columns then basic paint. Awesome... hopefully one day there will be a full game to play (cross my fingers)! Keep chipping away at the problem... you'll get a working version with persistence! Also, the link to the remastered Ultima IV by Mager Valp. Niiiice! I present the statue of the west! Keeping chipping away at it. The way you keep posting "stand-alone images" just seems like you are a tease! Are you some kind of prostitute? Sorry, I know that sounds schizophrenic! Maybe most people will have mixed results? You never know unless you publish. Last Edit: Apr 23, 2015 8:46:28 GMT by hydrophilic: Typos!! working on the credits screen and load part of the game. So I guess / hope / pray that you will have something (soon) that we can play with? Err... just hoping you can do better!